Summary: Nemesis falls to the worst problem any entry into the Star Trek canon can have: it simply doesn't bother to wrap itself in a fully realised universe. It does, however, offer glimpses of a heroic epic-that-almost-is. Let me begin this by saying, in spite of everything I am about to say, I did like this film. I like the idea of what this film could be. I like the 45 minutes or so that the film could be boiled down to. I like the ten minutes of truly powerful cinema the film containsten minutes that, not surprisingly, exist because of the skill of the actors, not the strength of the script or power of the CGI. Nemesis falls to the worst problem any entry into the Star Trek canon can have: it simply doesn't bother to wrap itself in a fully realised universe. Instead of establishing the relationships between the characters, there are winks and nods: "Hey, you guys in the audience remember how these two are good friends, right? So, okay, bear that in mind. Now, you actors, go run around and shoot things." There is idiot lecture: "I still can't believe the Captain is allowing us to do a full memory download," declares Geordi LaForge (actor LeVar Burton), or words to that effect. Info-dump declarations are the sort of sloppiness any fanfic editor can spot from three weblinks away. The script is a first-draft effort: Here we'll have a celebration so everyone can get together, and then there's a big emergency, then we'll need to show some Romulans, then Riker will have a fight, and the big scene at the end will have a green-glowy something that gives you the same shivers the Death Star did when it powered up its planet-smashing doodad. That's all well and good, but any writer worth her salt knows that once you have the bare outline, it's time to add the depth, the flesh. Those first ideas may be rearranged; some of them may be dropped entirely. In the end, the finished piece is lean and mean and tight and toned. Or it should at least look as if it made a few efforts to get down to the gym during lunch. This script must have spent its lunch hours eating fast-food, then wandering back to work feeling too sluggish to get much done the rest of the day. The direction is as listless as the script, although I'm not sure what could have been done to bring more life to a script in this stage of bloat. The cinematography carries on the Insurrection (Star Trek movie #9) mode of presenting everything in the sort of tight focus that ought to be reserved for quicktime movies on the internet. The entire audience is turned into "close talkers" who spend so much time looking up people's nostrils that the climactic emotions, as the camera draws (once again) into the personal space of the actor, lose any impact. Not to mention the distraction of looking for the contact-lens lines in Data's amplified eyeballs. At that extreme a closeup, he is no longer Datahe is Brent Spiner, actor in facepaint and yellow contacts. As a series episode, Nemesis would have been supported by the episodes on either side of it. As a film, it is currently supported only by the weak (and equally poor visually) Insurrection. Better to consider it the second chapter of First Contact, film number 8. Consider a Nemesis edited down to about 45 minutes. Trim the fluff and the winks and nods to previously supplied information, pick up the pacing. If it follows as part of First Contact, the character development so sadly lacking in Nemesis itself would therefore be provided. Consider the new story: Picard, as portrayed by the perpetually scrumptious Patrick Stewart, Enterprise captain, as mighty as Kirk himself. Picard saves the world, saves the human race, saves his crew, never fails his friends. A celebration ensues, and then Picard strides into the fray againand he fails not once but twice. When it comes down to the act it will take to save his crew, he freezes. He fails to take any action at all. He does... nothing. (This is the occasion of one of the squandered closeupsa tight-angle look-into-the-mind, that an actor of Stewart's merits performs so well.) He fails utterly, and it is his friend, the sidekick, who must take up the challenge. (In my phantom edit, the scenes of Data's arrival are intercut with Picard's fight, to ratchet up the tension and pacing.) A scene or so later, as Riker's droning voice fades into a soft blur, the look on Picard's face is the second squandered closeup. Here is the only time within Nemesis itself where we have a clear understanding of the Data-Picard friendship. 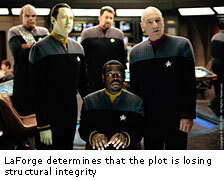 Then follows Picard's second stumble. As a friend put it, "we've seen both his heels." The second failure is implied; in a better film the implications would have provided so much momentum that it would be almost unbearable to have to wait for the next installment. At the very end, in a subtly sinister scene disguised by Picard's cheery optimism, you can see wheels spinning in Picard's mind. One imagines his thoughts: He can try to remake his friend, sublimate another being (B-4) into a duplicate. Create a cloneprecisely what caused all the tsuris of the entire movie. It would be a terrible disservice to Data. It will be a disservice to B-4, whose personality has already been compromised by the alternate personality embedded in his memory. The question is left tantalisingly open: will Picard be able to "raise" this being into maturity in a Wesley-way, or will they take the Shinzon path with Picard as B-4's viceroy? The ultimate hubris here is that of the filmmakers. Those responsible for a script that didn't bother to establish itself, to mature as a separate emotional vessel, grown into adulthood out of the nine films preceeding it. Outside food for Star Trek: Nemesis was a box of shortbread cookies and a four-pack of strawberry daiquiri wine coolers. Somehow, I knew I'd be needing a drink.